Ever since I started working from home, it has been a real struggle to keep my office area organized. Our office is in the middle of the house, and because of its central location, it becomes an automatic catch-all spot. Shopping bags, mail, magazines, books, and more end up piled around it; on the desk, on the floor...just about anywhere there's an open space. In fact, right now, I am looking at a golf club that my husband left on his desk chair. Awesome. 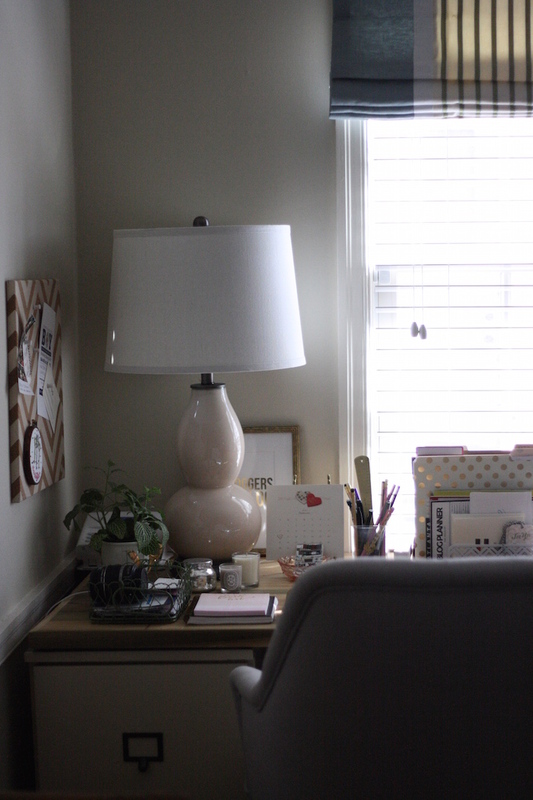 Because we share an office space together, keeping it organized is even more challenging than usual. Last week, I decided to show my workspace some love with a little help from The Container Store. The Container Store has long been one of my favorite shopping destinations for organization. They have so many options for decluttering that you can truly tackle any challenging space in just a few minutes' time. I love perusing their office aisles because of all of the containers and space savers they have. When I visited last week, I was like a kid in an organizational candy store - it was too much fun! 1. A stapler: I know this sounds crazy, but a stapler makes all the difference when it comes to organizing. You can immediately staple like-items together and file them away. For me, I always attach a client check to the original invoice. For one, that's how I make sure the invoice was paid, but for another, it helps me keep things organized for book keeping. 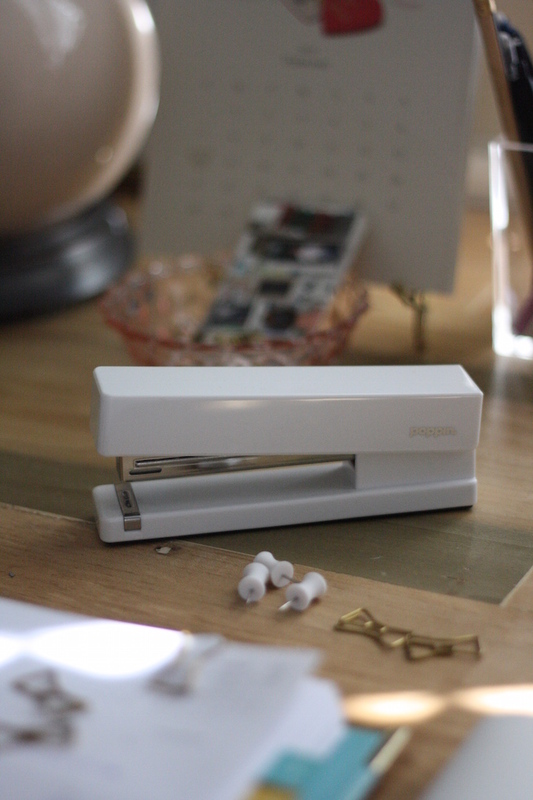 I love this white Poppin stapler because of its sleek design. 2. 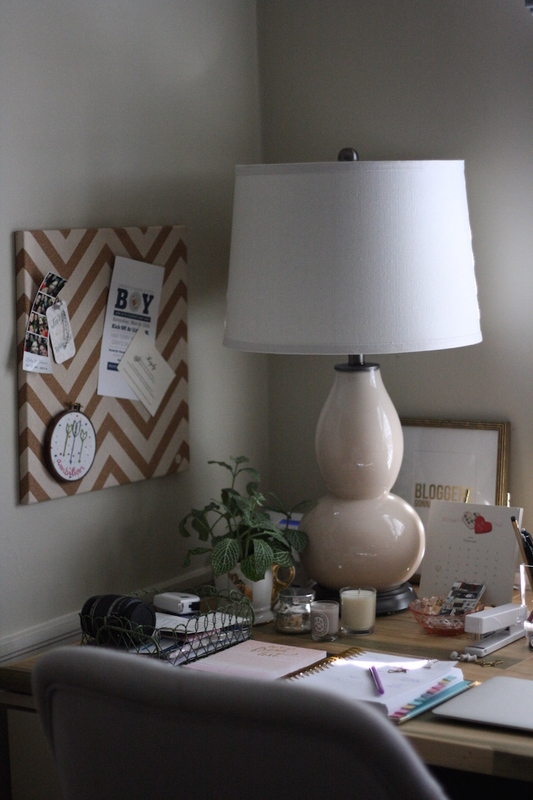 A memo board: Memo boards are a great way to get clutter off of your desk and in a home. Mine is currently home to my favorite photostrip of my besties, two invitations for showers and weddings, and a pretty awesome embroidered hoop I received as a gift from the cutest Etsy shop. This subtle chevron cork board comes in at under $15 and will do wonders for your organization (and inspiration!). 3. Cute push pins & paperclips: Push pins and paperclips are no brainers when it comes to office organization. The white Poppin push pins match my new stapler and tie my desk accessories together. And of course, paperclips are just as important for paperwork and more. I use mine to mark my place in my Emily Ley planner for easy access to a specific week or calendar. And do you really think I could walk away from bowtie paperclips? No way. 4. Letter organizer: This letter organizer (under $8!) was one of the first things I bought when I started organizing my space. Of course it helped that the style is called "Charleston," but beyond that, it has been a lifesaver for organizing everything from stationery to file folders. Each of the five above items were found at The Container Store, and lucky for Atlanta residents, the latest Container Store location is opening this weekend at Avalon! Visit the Grand Opening at the new location on Saturday, February 20th and Sunday, February 21st for tons of fun festivities including a $1,000 Elfa closet makeover! The store is also partnering with Children's Healthcare of Atlanta and donating 10% of all weekend sales. If you're local, don't miss it! 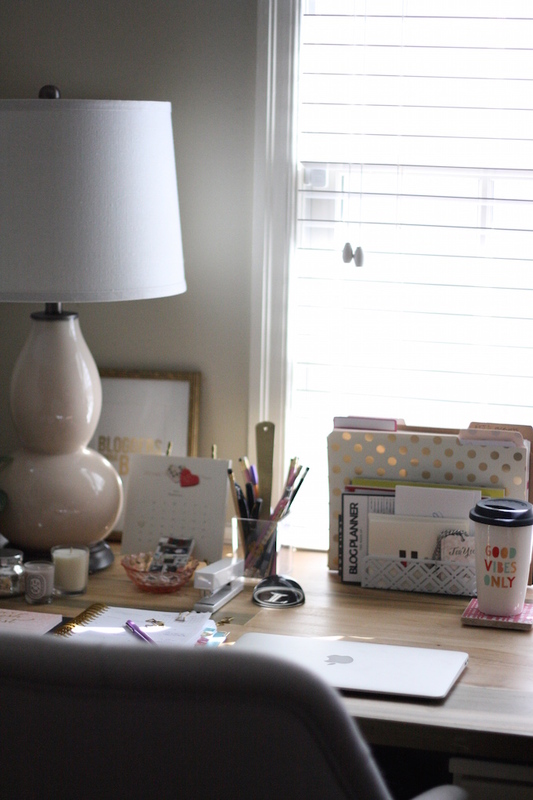 Any tips for keeping your own office organized? Let me know in the comments! 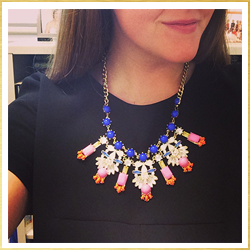 Thanks to the Container Store for partnering with me for this post. While some compensation was received, all opinions (and tips!) are my own.